Craig Baker, deputy managing director of Mira Showers, explains the benefits to installers and users of digital showers, the fastest-growing innovation in bathroom technology. From smart thermostats to smart plugs, our homes are at the centre of a digital revolution, and the bathroom is no exception, with digital showers the latest innovation in design and technology. And while digital showers may carry a higher price tag than the alternative mixer or power shower, the advanced functions and benefits make them an attractive option for both the user and installer. For installers, digital showers are a great opportunity to upsell to customers looking to fit a new shower. As well as the fantastic functionality offered by digital showers, one of the main benefits with a shower such as the Mira Mode, when compared to a mixer shower, is its uncluttered, minimalist look. As the valve is installed away from the showering area, only the compact user interface is installed onto the tiles, which leaves a fresh, clean finish. When it comes to digital showers, one of the key messages to give to customers is not to compromise on quality; choose a reliable brand, one with heritage. There are a wide range of digital showers available but, to prevent repeat call-outs, choose a name you can trust. So you’re sold on the idea of digital showers, but what about installation? From an installer’s point of view, it’s natural to be cautious when it comes to new technology – how easy it is to fit and what can go wrong are understandable concerns. In the past, digital showers have been perceived as a complex installation choice, however with the correct resources and guides, it can be as straightforward as any other shower installation. All the leading shower brands have the tools and support that you need to be able to recommend – and install – a digital shower and do it with confidence. With the new Mira Mode shower, for example, installation is made easy, with step-by-step guides on YouTube, or the Information User Guide which is included with the shower. In the unlikely event that something goes wrong during installation, the Mira Mode app includes lots of useful troubleshooting features. One great example of this is the outlets can be switched using the app so, should they have mistakenly been connected the wrong way round, there’s no need to start from scratch or fit additional pipework. Everything that the installer needs comes in one box, including a separate remote control, so you’ll have everything that you need from the start. It’s important to choose the digital shower most compatible to your customer’s needs; a high-pressure option is best suited to main pressure unvented systems and combi boilers, whereas a pumped option is appropriate for low pressure gravity systems. Mira’s Platinum and Mode digital showers are available for both gravity-fed and combi and high pressure systems, so whether it’s ceiling or rear fed, single or dual outlet, there is a digital shower to suit. You also need to consider whether to fit a wired or wireless shower; each with their own benefits, but different installation methods. 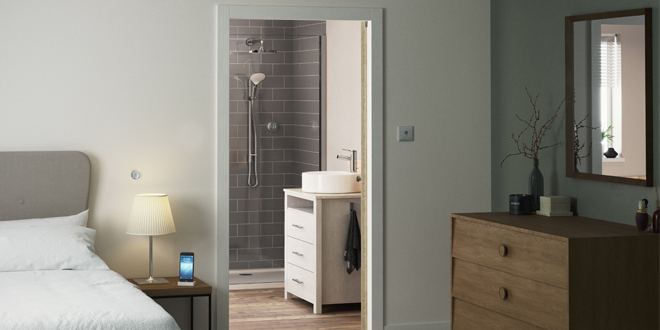 Wireless options mean that the controller connects to the shower valve remotely, allowing the shower to be turned on or off and the temperature adjusted via a remote control, which works up to 10 metres from the shower. Wired digital showers use a data cable, rather than the valve speaking to the controller wirelessly. For minimum disruptions of the wall tiles, a wireless digital shower may be the best option. Whichever options you choose, digital showers are a game changer when it comes to the daily bathing routine, offering the best of both worlds – form and function.